Mark, Richard Michelson (on JOMB), Tony Diterlizzi and Scott Fisher spoke for three hours about almost everything related to children’s books and the publishing industry. It was a very cerebral conversation, much of which revolved around print and digital books, the future of the industry and competing with technology for reader attention. There were light moments, too, like when they did an analysis of Jon Scieszka‘s (on JOMB) reign as the first National Ambassador for Young People’s Literature. Take note of the name Jeff Mack. He’s a relative newcomer to children’s books and has a very bright future. His stories are endearing and his illustrations inviting. We had the chance to see him in action and better understand his creative process as he coached Lucy and Bayla through sketching, mixing paint and painting their own illustration. Perhaps more intriguing than books themselves is the story behind them; how they were conceived, how they were picked up by a publishing company and how they were edited. Author/illustrator Jeff Mack has many incredible stories to tell from his young career and he took the time to share many of the stories and explain his creative process to us. We particularly enjoyed how he engaged with Lucy and Bayla and how they may have had an influence on a creative decision for his upcoming book, Dog Wants to Play, due out September 3, 2009 (author: Christine McDonnell). After a short walk in a light rain and lunch at Atkins Farms, we arrived at the Eric Carle Museum of Picture Book Art. Nick Clark, the museum’s Chief Director, gave us a private tour and allowed us to film specific parts of the gallery. He shared the history of the museum, and walked us through Eric Carle’s book creation and illustration process. The Carle was the first museum we’ve been to that specifically promotes and celebrates creativity. Besides the amazing art, multilingual library and a customer-centric book shop, the gallery boasts the always-open Penguin Art Studio where children and adults of all ages can create art of any sort. According to pen.org, PEN is an association of writers working to advance literature, defend free expression and foster international literary fellowship. There are chapters all over the world and not long ago, we connected with author Fran Manushkin (on JOMB), regarding an event of the New York PEN group of which she is co-chair. A member of the group audio recorded the March 16, 2009 presentation by Jason Low of Lee and Low Books (on JOMB) and we are lucky to include excerpts of Mr. Low’s talk — anecdotes of the origins of Lee and Low, the amazing story behind some of their award winning books and insight into the term “multicultural”. Thanks to Fran Manushkin, Paul O. Zelinsky, Susanna Reich, Betsy Bird and Lyn. Be sure to listen to our interview with Lee and Low co-founder, Philip Lee (now retired). Did you know that the first children’s picture books featured illustrations produced from wood engravings? Technology made way for lithographs and drum rollers and eventually computers which aren’t just part of the printing process — they figure prominently in the creative process. Jarrett Krosoczka (on JOMB) shows us how he’s using his laptop computer for his new Lunch Lady graphic novel series, the first two editions of which will be available on July 28, 2009. 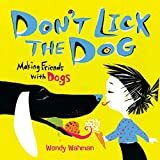 Outrageously bright and pointy, stylized illustrations and catchy how-to rhyme deliver digestible tips for canine encounters of the friendly, yappy, growly, wary, jumpy, licky, snappy kind. And if you’re a fan of dogs, kids and literacy, you may be interested in the Reading with Rover and D.R.E.A.M. (dogs for reading, education, assistance and more) programs. It was like picture-book-boot-camp. We had an 8am workshop and our training officer, one Jarrett Krosoczka (on JOMB), didn’t waste any time. After a quick introduction to his pug Ralph Macchio and his fantastic creative environment, Jarrett demonstrated his illustrating and painting technique. Before long, Lucy and Bayla were rolling up their sleeves and trying out what they had just learned; prepping the illustration paper, mixing paint and shading to create three dimensions. At the end of the whole process, we had an original Krosoczka/Ross-Blevis painting to bring home. Oh yeah, it was when we finally arrived at Jarrett’s (after being coached to his place over the phone) that we decided we weren’t going to get lost en route to any more of our scheduled appointments.